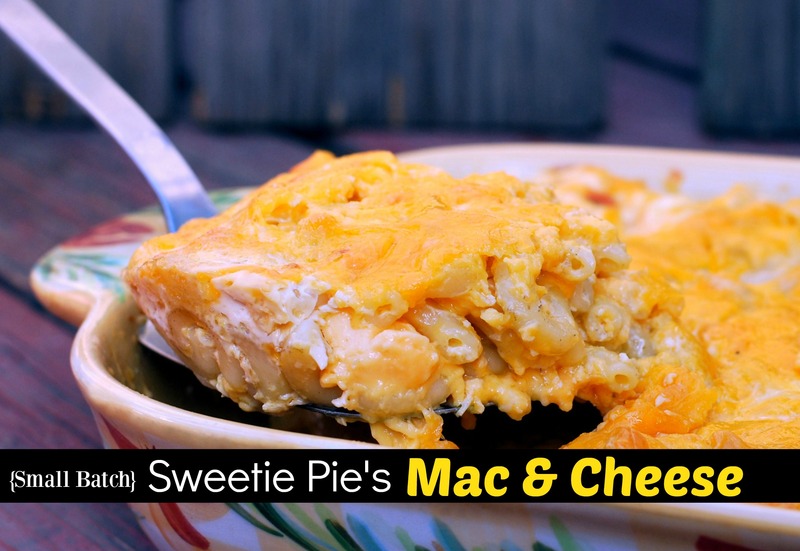 The first time I had Sweetie Pie’s famous mac and cheese was a few years ago at my sister-in-law’s house & it was love at first bite 😉 I don’t know why I waited so long to make it myself other than the fact that the recipe made a HUGE lasagna pan (bigger than 9×13) batch and that’s just way too much for our little family. Well the other day I couldn’t get it out of my head so I decided to try halving the recipe and it turned out PERFECTLY. Now don’t get me wrong, halving the recipe still made a big ol’ 2 quart casserole pan of it. Which was enough for our family of 4 to have it as a side, 2 nights in a row. I just can’t say enough good things about this macaroni and cheese recipe. The combination of cheeses is just TOO good! I hope you guys love it as much as we do! Hungry for more? This Stove Top White Cheddar Cheese has a homemade cheese sauce that is out of this WORLD delicious! Click here for the recipe! This baked macaroni & cheese recipe only has 4 ingredients and one of our ALL time favorite recipes! Click here to give it a try! Grease a 2 quart casserole pan. Add sliced butter along with the colby, monterey, cheddar and velveeta cheeses to the casserole pan. Cook macaroni noodles al dente and drain. Stir hot cooked noodles into the butter and cheeses in the casserole dish until mixed well. Combine evaporated milk, whole milk, egg, sour cream, sugar, white pepper and salt in a bowl and whisk until smooth. Pour evenly over macaroni noodles and top with more shredded cheddar. Bake at 350 degrees for 30-45 minutes or until top is lightly browned. ENJOY!! !